To obtain a reference dataset for the assessment of the GCM absorbed shortwave radiation at the surface, the observed values of the incoming shortwave radiation from GEBA had first to be weighted with their associated surface albedos. They were taken from the albedo climatology provided by the Surface Radiation Budget Project SRB (Darnell et al. 1992) as described in Section 2. The differences between the absorbed surface solar radiation calculated in the ECHAM3, ARPEGE, and HadAM2b GCMs and the observed estimates at the 720 sites are shown in Figure 2c. The differences have been avera ged over the sites in latitudinal belts of 5°. All three GCMs show very similar tendencies: Too much solar energy is absorbed at the surface, particularly in low latitudes. 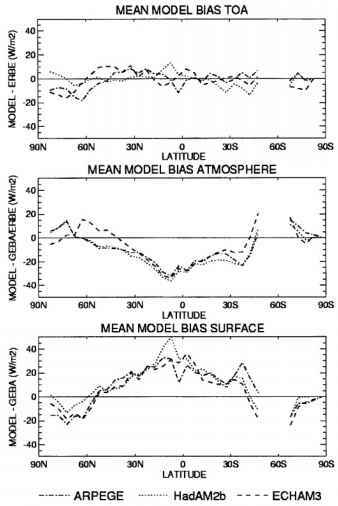 The global mean surface absorption in these models is also 10-30 Wnr2 higher than the estimates of Ohmura and Gilgen (1993) and Wild et al. (1998) (Table 1). At high latitudes, the models tend to underestimate the absorption of solar energy. This implies an excessive meridional gradient of absorbed solar energy at the surface in all three models, a typical feature of current GCMs. To determine the origins of the above biases at the surface, the total absorbed solar energy in the surface-atmosphere column at the 720 GEBA locations is examined, which has been directly measured by satellites during ERBE. Differences between the annual mean model-calculated net shortwave fluxes at the TOA and the ERBE fluxes are shown in Fig. 2a, again averaged over the sites in the 5° latitude belts. The agreement is much better than at the surface with biases smaller than at most latitudes. The global mean values of the GCM shortwave TOA radiation budgets in Table 1 are close to the ERBE value of 240 Wm~2, partly due to the tuning of the planetary albedo in the GCMs to the ERBE estimate. This indicates that the total amount of solar energy absorbed in the climate system is well captured in the models, and is not the main cause for the biases detected at the surface. 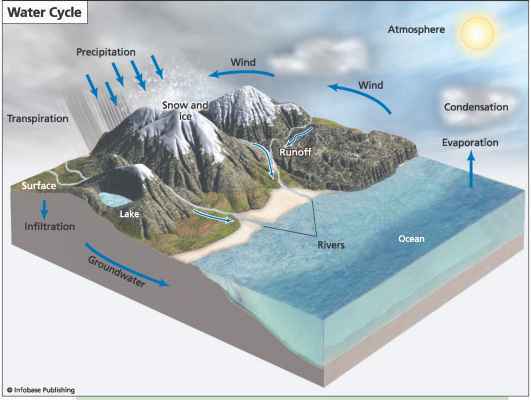 Thus, the biases at the surface have to be attributed to deficiencies in the absorption within the atmosphere. estimates of Ohmura and Gilgen (1993) and Wild et al. (1998) in Table 1. The above results strongly suggest that the biases in the model-calculated fluxes found at the surface are not caused by deficiencies in the net amount of solar energy absorbed in the climate system, but rather due to errors in the atmospheric absorption. This is particularly evident in terms of a lack of shortwave absorption in the atmosphere of the mid- and low latitudes. The difficulty common to all these models thus lies in the partitioning of the absorption of solar radiation between atmosphere and surface. This problem could only be detected due to the combined use of satellite and surface data. With satellite data alone, this problem would still be unknown.